The MP1R is an MP1B with an SW1 SuperWhip Ruggedized Antenna Whip on the top of it. From the #1 HF Portable Vertical Antenna in the world, comes the new MP1R SuperWhipTM ruggedized version of the famous MP1 SuperStickTM. This durable antenna features an amazing new indestructible stinger top whip, so flexible that it can be rolled up in a circle and stowed in the GB1 Super Go Bag. Operators choose the MP1R because it is reliable, powerful, compact, and versatile. It covers the entire range of HF ham bands, all shortwave frequencies, marine, CAP, MARS, and everything in between. Analyzers or tuners are not needed. Simply adjust the SuperSlider to your operating frequency using the included FG1 Frequency Guide SWR ruler, and start transmitting. Instantly expand it up to full size for EmComm deployments, Mobile, Backpacking, DXpeditions, or base installations. 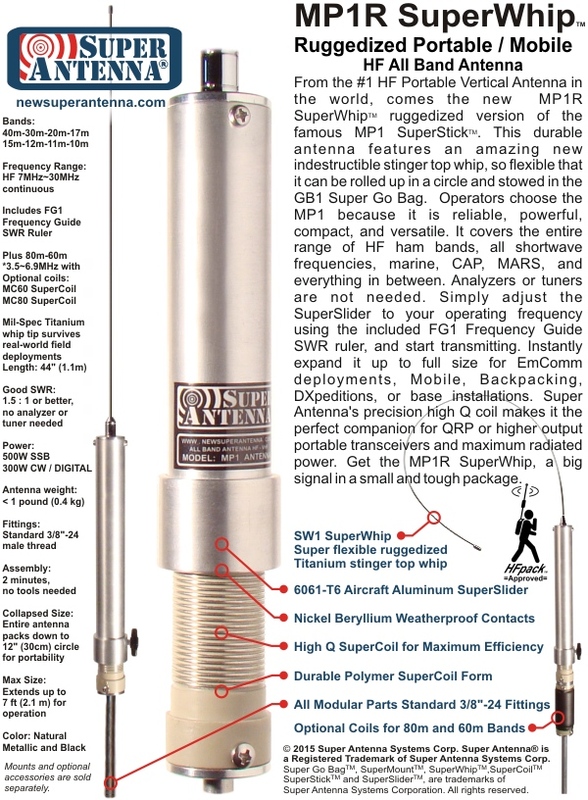 Super Antenna's precision high Q coil makes it the perfect companion for QRP or higher output portable transceivers and maximum radiated power. Get the MP1R SuperWhip, a big signal in a small and tough package. 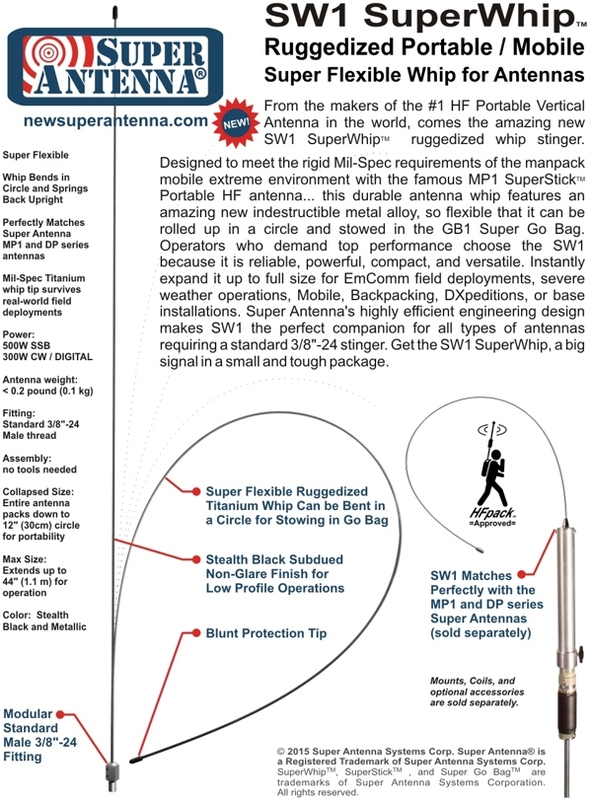 Designed to meet the rigid Mil-Spec requirements of the manpack mobile extreme environment with the famous MP1 SuperStickTM Portable HF antenna... this durable antenna whip features an amazing new indestructible metal alloy, so flexible that it can be rolled up in a circle and stowed in the GB1 Super Go Bag. Operators who demand top performance choose the SW1 because it is reliable, powerful, compact, and versatile. Instantly expand it up to full size for EmComm field deployments, severe weather operations, Mobile, Backpacking, DXpeditions, or base installations. 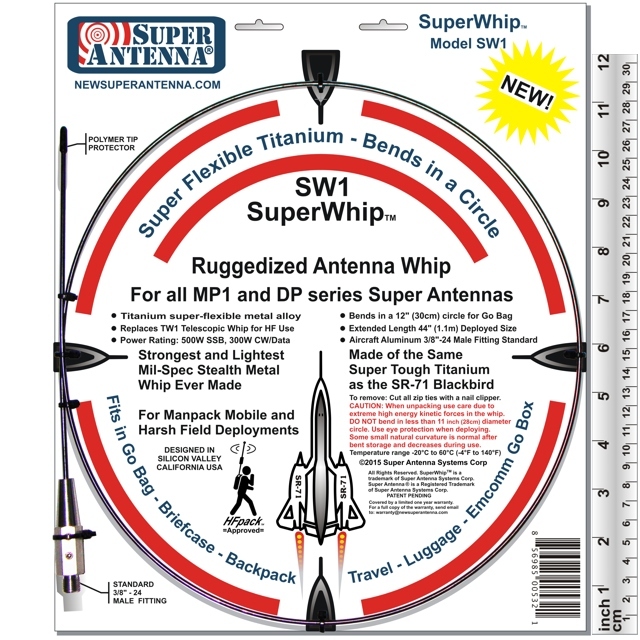 Super Antenna's highly efficient engineering design makes SW1 the perfect companion for all types of antennas requiring a standard 3/8"-24 stinger. 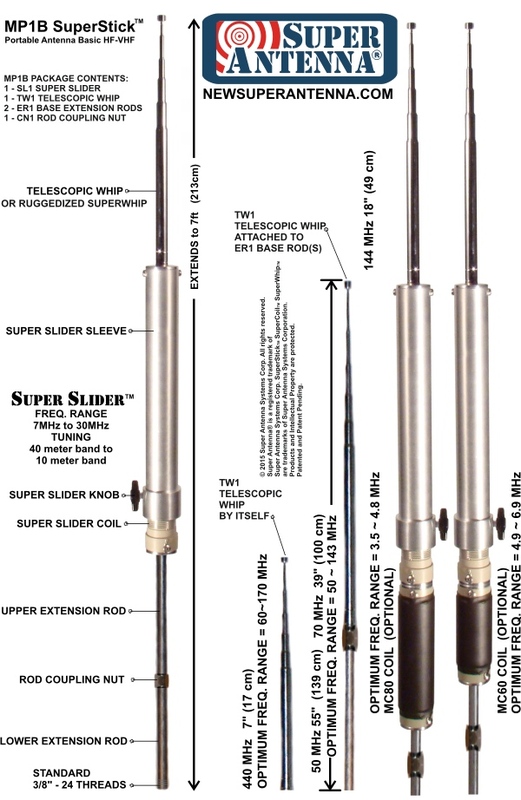 The Super Antenna MP1R SuperWhip is a Ham Radio HF Portable Antenna for Indoor or Outside field use. Big signal in a small package. 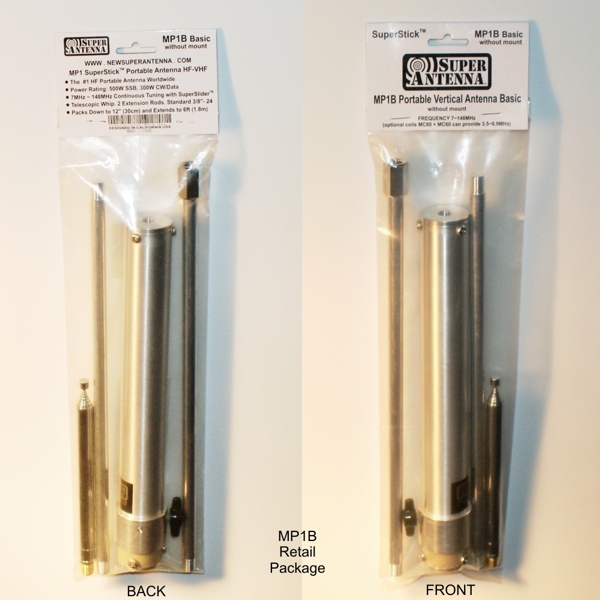 MP1B forms the basic core antenna of the various MP1R Super Antenna. It is a manually tunable antenna. It can form a portable vertical or a mobile whip. Two MP1B units can form a portable rotatable dipole, with a suitable dipole mount.